As we prepare to dive head first into the 2015 holiday marketing season, it’s important to look back and reflect on what worked and what didn’t. To be great, it helps to surround yourself with those who do great things. On that note, The 2014 holiday season featured an amazing collection of campaigns that got shoppers in the mood to spend their money. From hilariousness to tugging at your heartstrings as well as completely innovative, the top retailers battle it out to score the top position for the best holiday campaign of 2014. Since there were so many goodies to choose from, we chose our 5 favourites to showcase! Who could forget the 2013 holiday campaign when Joe Boxer & Kmart launched their underwear commercial featuring hunks shaking their junk to Jingle Balls whoops, Bells! I mean, how can you top that?! Well, believe it or not they did and they took a different approach with “Jingle Bellies.” The handful of Average-Joes expose their tummies and pound away to the tune of Jingle Bells, wearing JB pajama bottoms instead of boxer-briefs. Even though the follow-up will never be as good as the original, Joe Boxer definitely grabbed their audiences’ attention by keeping a consistent holiday theme for the last 2 years. One of the biggest problems retailers face on Instagram is the ability to make their posts shoppable, and link back to their website. 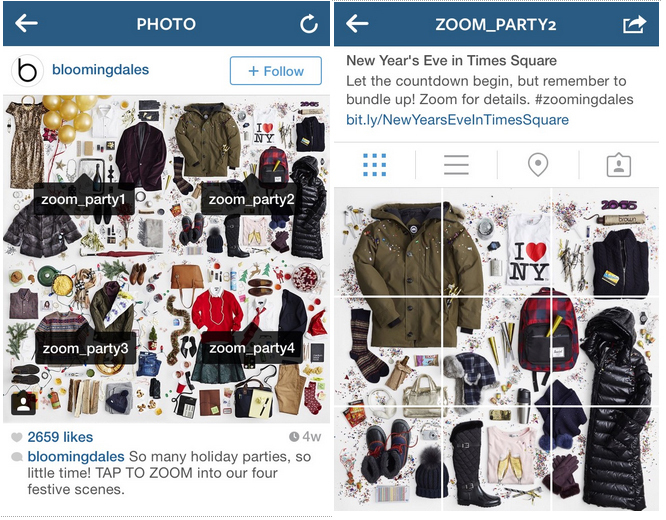 So Bloomingdales takes what we love about Pinterest and Instagram to make one very successful holiday campaign. Launching their #Zoomingdales campaign, a single post is packed with several potential holiday outfits giving you the option to zoom in on your favourite, simply by clicking on the image tag – all linking back to their website! It’s so creative and even easier to use. By far, one of the most innovative campaigns on Instagram to date! Last year H&M partnered with Lady Gaga and Tony Bennett for the holidays to feature their #1 album “Cheek To Cheek.” This power duo was definitely a force to be reckoned with: Lady Gaga is one of the greats of her generation, and Tony Bennett is a world-class performer and 17-time Grammy winner. Gaga and Bennett performed “It Don’t Mean A Thing (If It Ain’t Got That Swing) during a 1940s-themed commercial, featuring exactly what you’d expect from the two most glamourous artists: glitz, glam, fur, sequins, and an oversized wig to complete Gaga’s ensemble! Best Buy really got creative last year with not 1 but 2 holiday campaigns! The first campaign encouraged their customers to use the hashtag #HintingSeason to show off how they’re hinting for the perfect gifts. The second campaign was all about “Holiday Hacks,” sharing Vine videos of new and creative ways to use their products. These awesome Holiday Hack videos really got shoppers in the mood to start spending & their sales don’t lie! Apple did it again by pulling on your heartstrings with their holiday ad “The Song,” about a young woman who finds an old record of her grandmother singing her favourite song “Love Is Here To Stay.” Using Apple products, GarageBand and the iPad Mini, the woman collaborates her music and vocals with her grandmother’s record. She leaves the surprise gift for her grandmother, along with sentimental photos for her to reminisce while she listens to the duet. We absolutely loved this commercial because it’s not only sentimental and nonchalantly features Apple products, but it seamlessly brought the two generations together. Did we miss one of your holiday favourites from 2014? Please share – we’d love to hear from you!